Located on the middle section of the Southern Area at Mogao, this cave was constructed in the High Tang and renovated in the Middle Tang, Song and Yuan dynasties. It is one of the representative cave of the Tang dynasty. The main chamber, square in plan, has a truncated pyramidal ceiling and a niche in the west wall. The ceiling center depicts a peony surrounded by cloud patterns. On the four sides are various decorative patterns, such as the motif of two partly overlapped squares, half medallions, diamond lozenges, medallions, and draperies in red, blue and green colors, looking bright and fresh. The four slopes are covered with the Thousand Buddha motifs. In the center of the south wall is a preaching scene (two pieces taken away by Langdon Warner in 1924). The central statue is lost, while the back halo in bas relief as well as one disciple and two bodhisattvas have survived. The ceiling of the niche highlights a preaching scene of Maitreya, in which two disciples, four bodhisattvas and two heavenly kings stand in order. There, heavenly kings wear chain mail and tabards which can protect the legs in battles. There is no such example in other preaching scenes in Mogao. On the walls of the niche are eight disciples and two bodhisattvas in gorgeous costumes. An image of Avalokitesvara is painted on either side of the niche. The north wall is covered with the illustration of Amitayurbhavana-sutra with the pure land in the center and two side scenes illustrating the stories of the Sixteen meditations and of the stories Between King Bimbisāra and Ajātaatru, similar to the illustration of the Amitabha in composition. This illustration creates an elegant ambiance mainly in blue, green and black, focuses on the incarnated boys on the lotuses in the pond, auspicious birds and beasts, as well as musicians. It represents a style of the same themes of the High Tang dynasty. The space above the entrance wall is filled with the Thousand Buddha motifs, and the south side of the entrance depicts two Bodhisattvas above a male donor figure (vague) painted in the Song dynasty; the north side are two bodhisattvas of the Song dynasty and a worshipping bodhisattva of the Yuan dynasty. Most of the illustration on the south wall was severely damaged by Langdon Warner who tried to peeled them away. The upper part of the picture includes four intact flying apsaras scattering flowers in two symmetrical but dynamic groups. The former looks back, echoing the movement of the latter one. In composition, the narrow blank along the upper brim is used artfully. This is one of the representative picture of Apsara of Early Tang period at Mogao. The west niche has a group of statues including a central Buddha, two disciples (one lost), two bodhisattvas. On the ceiling of the niche is a preaching scene of Maitreya (a corner is damaged). Against the walls are halos in bas relief flanked by four disciples and one bodhisattva. The edge of the niche is decorated with half medallion patterns. The north wall is covered with an illustration of Amitayurbhavana-sutra with two side scenes depicting the Sixteen Meditations and the story of King Bimbisāra and Ajātaatru. On the east side is a Middle Tang bodhisattva and a Buddhist monk, while on the west is a Middle Tang bodhisattva whose lower part is blurred. Below the illustration are seventeen donor figures of the Song dynasty. The ceiling center is a pattern of a peony with clouds srrounded by various motifs such as two partly overlapped squares, half medallions, diamond lozenges, medallions, and draperies in red, blue and green colors, looking bright and fresh. The four slopes are covered with the Thousand-Buddha motifs. Your privacy is very important to us. This Privacy Notice explains what personal data the Digital Dunhuang Repository (shortened as Digital Dunhuang below) collects from you, through our interactions with you and through our services, and how we use that data. This statement applies to all the services provided by Digital Dunhuang. With the expansion of Digital Dunhuang's services, this statement will be kept updated by the Digital Dunhuang without additional notices. The updated privacy will be an effective replacement of the original one once it is publicized in our website. Digital Dunhuang provides personalized services by using Cookie to help with personalized online experience, collect and store useful information, including language settings and search and browse preferences. Cookie will not keep track of personal information such as account number and password. The Cookie of Digital Dunhuang can only be read by our website, and you can modify your browser settings to accept or refuse the Cookie according to your requirements though we suggest you to accept it. If your browser is set to refuse the Cookie, Digital Dunhuang will not be able to provide you with personalized services though the website is still accessible. Dunhuang Grottoes is not only a brilliant art treasure of ancient Chinese civilization, but also an important witness to the dialogue and communication between different civilizations that had taken place on the ancient Silk Road. 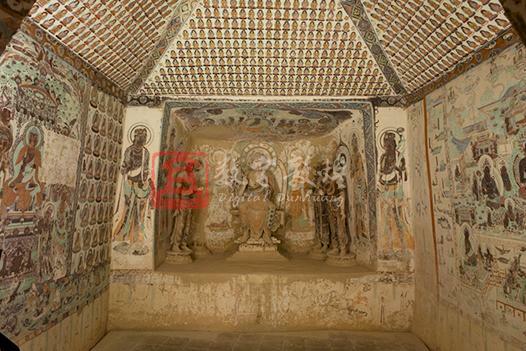 Guided by cultural relics protection philosophy, this Digital Dunhuang Project is pursuing overall digitization, including collection, processing and storage of the Dunhuang Grottoes and related cultural relics by using advanced science and technology. It integrates all kinds of data including the photos,videos,3D data and other literature data into a digital repository of cave cultural relics which is diversified and intellectual, and can be co-shared globally through Internet. A support system will also be constructed for digital asset management system and digital resource science. The "Digital Dunhuang" project is of demonstration significance in this century, and it has a long way to go. On the basis of extant achievements, we will continue to innovate and cooperate with others to make unremitting efforts for the permanent preservation and sustainable use of Dunhuang's cultural heritage.